I Love Chicago! : Sounds like I need a stronger magnet. As with many caches in an urban setting, the buildings will give your GPSr fits. Be sure to check the maps before heading out and as always the hint can be a big help. This is an offset cache. Get near. Find the sign. Walk 2 1/2 paces west. Sit down and find the cache. Have Fun! The start of Route 66 has moved a few times. 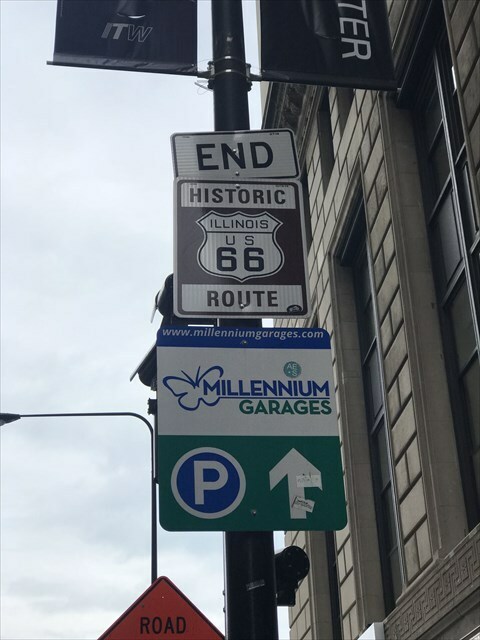 Originally, Route 66 began on Jackson Blvd. at Michigan Ave. In 1933, the start (and end) was moved east onto the reclaimed land for the world fair to Jackson and Lake Shore Drive. 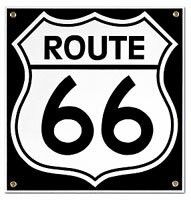 In the 1950s, Route 66 became the main highway for vacationers heading to Los Angeles. The road passed through the Painted Desert and near the Grand Canyon. Meteor Crater in Arizona was another popular stop. This sharp rise in tourism in turn gave rise to a burgeoning trade in all manner of roadside attractions including teepee-shaped motels, frozen custard stands, Indian curio shops, and reptile farms. Meramec Caverns near St. Louis began advertising on barns, billing itself as the "Jesse James hideout." The Big Texan advertised a free 72 ounce steak dinner to anyone who could eat the whole thing in an hour. It also marked the birth of the fast-food industry: Red's Giant Hamburgs in Springfield, Missouri, site of the first drive-thru restauraunt, and the first McDonald's in San Bernardino. Changes like these to the landscape further cemented 66's reputation as a near-perfect microcosm of the culture of America, now linked by the automobile.